This is only the 4th record of this species in the Philippines. Dunlin in this plumage looks similar to Curlew Sandpiper. In breeding plumage the Dunlin has a conspicuous black patch at the center of its belly. This is the description in the Kennedy guide of the difference between Dunlin and Curlew Sandpiper: "Separated from more common Curlew Sandpiper by being squatter, with shorter legs and neck, dark rump, and long bill decurved only at tip. Broad-billed Sandpiper is smaller, has darker upperparts, and divided white eyebrow." Curlew Sandpiper has a white rump that is visible in flight. There were 9 Dunlin seen in various parts of the mud flats. We were in an area of salt pans and mudflats. According to Rob H, waders prefer mudflats because there is much more food in the mudflats. They only move into the salt pans when the tide comes in and it becomes too deep to feed on the mudflats. The key feature we were looking for was the dark markings on the chest and belly. Some individuals had darker markings than others. 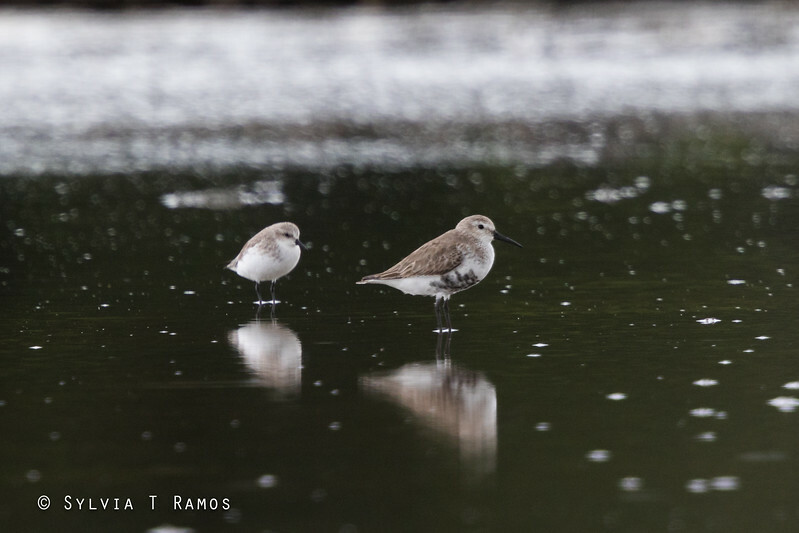 One Dunlin was first reported in the area by Mark Jason Villa, Cristina Cinco, and Arne Jensen.